First up is Richard Scott. 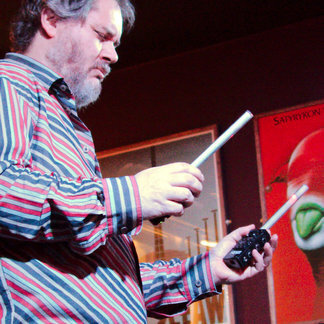 Scott is a UK-born, Berlin-based composer and free improvising musician working with analogue modular synthesisers and alternative controllers, including pioneering work with the Lightning controller built by Don Buchla. For our first instalment, Scott selected works by Cabaret Voltaire, Miles Davis, and the Spontaneous Music Ensemble. Thanks so much to Richard for providing these insights into his listening world. Below is an example of his own live performances, or you can browse recordings on his Bandcamp page. Stay tuned for the next instalment!